In an age when information is everywhere, the challenge is finding safe, effective, and evidence-based science. Cue the National Strength and Conditioning Association, the world’s leading organization in strength and conditioning. The first release of Strength Training redefined exercise instruction with no-nonsense, straightforward science. Now the new second edition raises that bar even further. 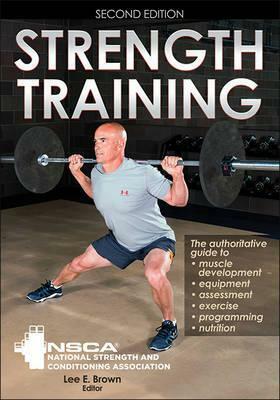 Written by a team of experts chosen by the NSCA, Strength Training combines the most valuable information with best instruction for proven results: – Assessing strength to personalize programs – Incorporating new exercises and equipment for increased intensity – Increasing muscle mass as well as strength, power, and muscular endurance – Preventing injuries – Improving performance Serving more than 30,000 members from the sport science, athletic, allied health, and fitness industries, the NSCA is the authoritative source on strength training. Now the proven techniques developed by these renowned experts are available to you. Whether you’re launching a lifting program or fine-tuning a serious training regimen, Strength Training will fill any knowledge void and correct the misconceptions to ensure proper technique, safety, and progressions. Multiple program options for specific machines, free weights, body weight, and other types of apparatus provide the flexibility to tailor your training to personal preferences or needs. It’s the authoritative guide from the world’s authority on strength training.